The Lake San Marcos Democratic Club was honored to host three members of the San Marcos Fire Department at the July monthly meeting. Doug Chalmers, Captain, Matt Drabinski, Paramedic and Neil Wagner, Engineer shared with us their personal stories of those horrible days in May when the Rancho Bernardo, Carlsbad and Cocos fires broke out, 3 of a total of 14 fires that week. Neil’s participation began with an order to report to Station #2, the fire house across from the Lakes entrance on Rancho Santa Fe Rd. He was assigned to the “water tender”, a 2,000 gallon tanker truck that immediately reported to the fire. He spent most of his time “punching in hoses” or laying the hoses down onto the ground 1000 feet straight uphill. The next day he was assigned to work the Cocos fire from the Elfin Forest side. He recounted the horrors that were ongoing when the truck pulled up. As soon as he got out of the rig he said, “I heard the loudest explosion I have ever heard in my life” as he described the explosion of a propane tank that landed not more than 50 feet away from the Escondido Fire Chief. He watched an old little white church burn to the ground in less than 4 minutes as did many of the homes in the Harmony Grove Spiritual Community. He explained that they will do everything they can to save lives if structures are inhabited but when empty, and already hotly burning they will not risk their lives to save a structure. Most importantly, many of the structures back in that area had violated the #1 rule of fire defense preparation: they had not cleared defensible space around their community and homes and as a result many of those homes are now gone. We were in awe as he described that he did not get to sleep until the third day, and those three days were filled with climbing up and down mountains with 50 lbs. of gear, eyes watering from smoke, “snot” flowing freely from noses, and fire everywhere. 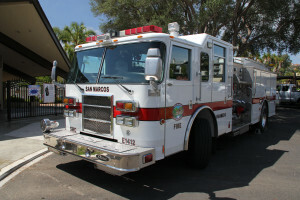 Doug, the San Marcos Captain was told to report to Station 4 in San Elijo Hills. 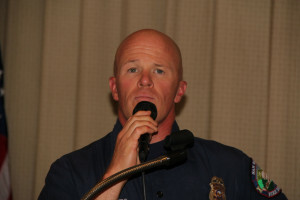 As a Captain he described his main role as managing behind the scenes, focusing on where fire fighters and equipment needed to be assigned or moved around as the fire progressed. He was assigned to the Carlsbad fire on the second day, tending to the fire at the point of origin in the hot, dry East wind conditions that were fanning the flames. He described a scene of “organized chaos” where “the fire was so far ahead of us we were playing catchup, staffing it on one end, then hopping back and forth on the edges trying to contain it and protect the homes”. When it slowed a bit he happened to look East and that’s when he saw the smoke coming from his home location of San Marcos. Doug ended up manning Station 2 for five days straight. He described the outpouring of help from the community. “You should have seen our kitchen,” he said, “everyone here at this meeting could have eaten for a week and not finished all the food that was dropped off”. Much of the food donations were shuttled to the city emergency operations center for the people there who staffed the phones 96 hours straight. Matt described his role as less exciting than Neil’s and Doug’s, but no less important. As a Paramedic manning an ambulance he not only has to deal with the fires but all the other duties of responding to medical emergencies throughout the community at the same time. He helped with the evacuation of people from the Lakes. All in all it was amazing that there was no loss of life and that the fires were fairly well contained given the hot, dry windy conditions and the numerous fires happening at the same time. The temperatures were in the 100-102 degree range with only 5-7% humidity; 1,935 acres burned resulting in the loss of 5 homes lost in the city limits, and 2 more within the fire district, only 6 minor injuries; 30,000 people were evacuated. Doug described the coordination of the air resources for water drops. He indicated that this has gotten better every year and it worked well this time. A small plane from Cal Fire managed the other aircraft while flying circles over the fire. They led the tankers through the fire, setting the path that the larger planes followed and directing, via radio, where to drop the fire retardant or water. Helicopters were from San Diego City with additional helicopters and fixed wing tankers on contract. They also had help from the Navy and Marines, also managed by the same Cal Fire aircraft. So how can we better prepare ourselves against future fires? Regardless of where you live Doug indicated “you are the first line of defense – be prepared!” If you live in the back country or the “urban interface” areas – where houses back up to edges of canyon or coastal scrub – you must have at least 150 feet of cleared defensible space. They saw that made all the difference between homes that survived vs. those that burned. If you need help doing this you can call the fire district and they will help for a fee. Be careful when you are driving around or evacuating so as not to cause further accidents. And also important – if ordered to evacuate, do so. Landlines are included in the reverse 911 system, but you need to register your cell phones with AlertSanDiego.org. The app, SDEmergency, can also be downloaded to smart phones for constant alerts and updates. Be ready, have a list of what you actually need to take with you for quick packing. Pack belongings into bags or boxes that are easy to lift into cars and plan your timing so you can get out quickly. Don’t forget to plan for your pets as well, including food, water and crates. To better safeguard your home before you evacuate, move all woodpiles, BBQ grills/propane tanks and lawn furniture away from the house. Shut your windows, close blinds and drapes. Seal vents in the eaves to prevent ashes and embers from being sucked into the attic to smolder and flareup. As the meeting concluded, Mary presented them with a huge card signed by all the meeting attendees. Additionally they were presented with a “Thank You” poster comprised of photos of all the various thank you signs that community residents had made and displayed on fences, porch railings and other publicly viewed locations. As Mary reminded us, “Take care of yourself and your neighbors”. Good words for all of us to remember! ← The Roosevelts Are Coming! Mark Your Calendars.